Access Restrictions: The Capt. Parker J. Hall Collection is open to researchers. There are no restricted materials in the collection. The Capt. Parker Hall Collection consists primarily of correspondence from Hall to his sister, Lucie Hall Cushman of Duxbury, MA. Capt. Hall wrote his sister almost weekly, sometimes more than once a week, for many years (1920-1946). There are a small number of letters to Capt. Hall’s wife, Katherine Boyle Hall. The letters are from various ports along the Eastern seaboard of the United States. Also included in the collection are numerous newspaper clippings about Capt. 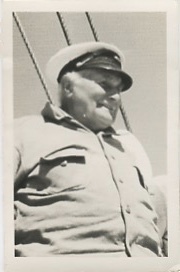 Hall and his life as the “Lone Skipper.” Many photographs and postcards are also included. Capt. Parker Jones Hall was born in Marshfield, MA on June 26, 1862. He was the son of George H. Hall of Marshfield and Ardelia Ripley of Duxbury, MA. George H. Hall was the keeper of the Gurnet Lighthouse for many years. As a boy, Parker Hall boarded for time with James Foster in Kingston, MA while he attended the Stony Brook School. At age 13 he began his seafaring career by ferrying boats to the Gurnet. He eventually purchased his own sloop, Rosewood, and hauled gravel from Quincy to Blue Hill, Maine. Aboard his schooner, Addie J, he hauled lumber, brick, gravel and crushed stone until 1890. His next vessel was the Robert P. King which he owned until 1899. The ship was used as a lightship for a time off the New Haven breakwater. Between 1910-1912 he owned the Angler, the Vigilant and the Mizpah. During WWI he owned the George Smith and carried lumber form Maine to New York, returning with coal. The ship was later left in Duxbury Bay and set afire by boys during a Fourth of July celebration in 1922. During the 1920s he sailed the Howard Russell which was lost off Swan Island, Maine. Aboard his next vessel, Carrie, he took groups of children from various camps out on three to four day excursions. His last vessel was the schooner, Alice S. Wentworth. Capt. Hall earned the nickname, the Lone Mariner, because of his preference for sailing solo. He was the only man known to have sailed a 136 ton schooner without a crew. He was married to Katherine S. Boyle of Randolph, MA in 1905. They owned a small cottage on Cove Street in Duxbury. The couple divorced in 1922. During his later years, Hall made his home in Sandy Point, ME. He died on Aug. 23, 1948 at age 86 and is buried in Mayflower Cemetery, Duxbury, MA.